Jersey Leo is the quintessential outsider—an albino of mixed race. Known as “Snowball” on the street, he makes a living as the bartender at a mob-run speakeasy in Prohibition-era Hell’s Kitchen. Being neither black nor white, he has no group to call his own. His own mother abandoned him as a baby. And his father—a former boxing champ with his own secrets—disapproves of Jersey’s work at a dive owned by one of New York’s most notorious gangsters. So when he inadvertently purchases counterfeit moonshine (“sugar pop moon”) with his boss’s money—a potentially fatal mistake—he must go undercover to track down the bootlegger who took him in. The clues lead to Philadelphia, where he runs into a cleaver-swinging madman out for his femurs and a cold-blooded gangster holed up on a Christmas-tree farm. Now with a price on his head in two cities, Jersey seeks help from the only man he can trust, his father. 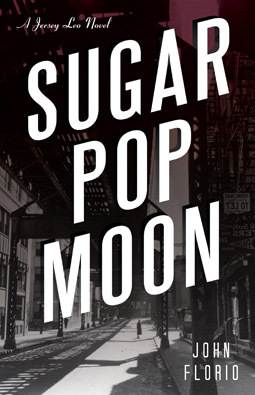 As the two delve into the origins of the mysterious sugar pop moon, stunning secrets about Jersey’s past come to light. To ensure his future, Jersey must face his past, even if it means that life will never return to normal. “A delicious journey through the underworld of Prohibition and Depression America, by turns funny, poignant, and thrilling. “Authentic period, savvy style, and memorable characters-particularly the albino protagonist, Jersey Leo-combined with a suspense tale well told adds up to a winning combination.